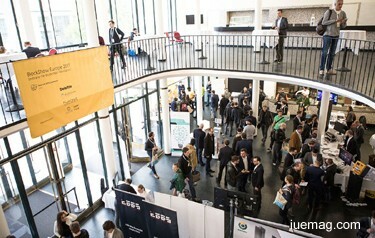 BlockShow Europe 2017 was held in Alte Kongresshalle, Munich. With 560 attendees, 26 exhibitors, and 26 speakers, the conference became the largest international Blockchain-related event ever organized in Europe. Here is a glimpse of what happened! Led by Elizabeth Lumley, the managing director at Rainmaking and one of the most famous women in Fintech, the event covered a number of hot topics ranging from practical application of Blockchain technology to aspects of running an ICO. Blockchain is believed to bring trust and privacy to a lot of different industries. It’s changing the whole paradigm of how things are done in the production field as well as the logic of business models and our general approach towards partnership and cooperation. Bitcoin legend Charlie Shrem compared Blockchain to the printing press and pointed that “the speed of its development is really incredible, therefore it is hard to say what direction we will go”. Many speakers noted that people still don't understand what Blockchain is, therefore they can't trust it. Next year BlockShow Europe will be back and will be greater in every aspect – with more sessions, more Blockchain projects, more exhibitors, more people. The Blockchain Oscar was organized by Cointelegraph Events, Humaniq and WINGS. The first round of the competition kicked off in March with a series of webinars, where participants were pitching their projects and had a chance to shoot questions to experts and members of the jury board. After thorough evaluation they have chosen six startups who pitched their ideas in front of the hundreds of guests at the stage of Blockshow Europe 2017 in Munich. 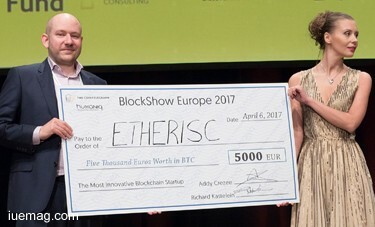 Etherisc was announced the most innovative startup and received €5000 worth in BTC. Company is on a mission to build decentralized insurance applications, making the purchase and sale of insurance more efficient, enable lower operational costs, provide greater transparency to the industry of insurance compared to traditional operations and democratize access to reinsurance investments. SolarChange left Blockshow Europe 2017 with the title ‘The Most Valuable for Humanity Startup’ and €5000 in Humaniq tokens on top of it. SolarChange is a web&mobile platform which integrates the SolarCoin Blockchain for incentivizing Prosumers towards the Energy Transition. Platform enables solar owners, solar monitoring companies and solar asset managers to register their solar installation and monitored solar installs to the SolarCoin program. The iUeMagazine team was delighted to have worked with BlockShow Europe 2017 as Online Media Partners & to have brought Unlimited Inspiration for all readers from the proceedings of this event. Any facts, figures or references stated here are made by the author & don't reflect the endorsement of iU at all times unless otherwise drafted by official staff at iU. This article was first published here on 17th May 2017.